This weeks Weekly Photo Challenge from Word Press’ “The Daily Post” has the theme “Heritage”. There is a lot of heritage in Franken, the region around Nuremberg. 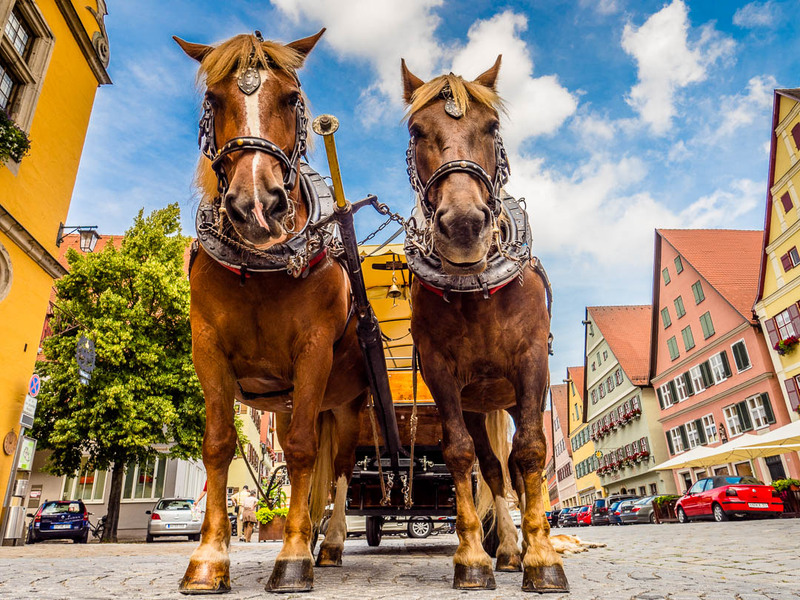 Among it are the many horse drawn carriages that take tourists through the historic centers of our towns. Many of those carriages are drawn by gargantuan cold blood horses, beautiful and amazing creatures. Also these horses are part of the heritage of this rural area, have the carried the load of heavy farm work for centuries. This photo gives also an impression what you can do with a 12mm wide angle prime lens, in this case the mZuiko 12mm F/2.0 that I had attached to my PEN-F. I was on my knees practically underneath the horses, shooting upwards looking through the swivel LCD screen of the cam. Have you checked out the Learning Center with all my free tips and inspirations around photography? What an inspiring post, Marcus. You matched the point. Shooting upwards in different angles makes images so beautiful and surreal. Have a splendid weekend. Thanks, Vicki! They are gentle giants, hence the name “cold blood”, referring to their calmness and cool temper. Love these heavy horses. Hope you get some time to relax this weekend. Thanks, Marion, I definitely plan for it 😉 ! Great Pic! I love the angle, fab perspective. I was intruiged by “cold blood horses” what exactly does that mean? Thanks for the comment, Karen! “Cold Blood” refers to the calmness and easy going temper of this big heavy horses, not to their body temperature. I’m glad a use has been found for these lovely working horses. Sadly, in England we only seem to have a few, living in heritage museums, or kept by people who love them, but cannot find work for them. That’s a great photo. Thanks for saying something about how you shot it and what gear you used, I always find that sort of thing interesting. Thank you so much 🙂 !! First, I thought that the horses were charging toward you and it was scary. I love this low point of view; everything looks so different. The horses are wonderful! Marcus, this is a great photograph! Love it! Beautiful horses and view. A real inspiration. Beautiful post, besides the fact that you are working too long and too hard. Hope things change soon for you. In our farming community there is still a lot of farming done with these horses! Thanks for your kind words. Doing conference calls in the middle of the night with the US is no fun indeed. But it will get better eventually! Great that you can see those horses still doing real work! Your posts really resonate, I follow you because you inspire me! Gosh Marcus, just gorgeous…hey, I appreciate you telling what your position was too in taking the shot as I’m always curious about this from photos I enjoy. I’m such a fan of that surreal look! Maybe you can tell us your physical stance while shooting more too or talk about it in your Learning Center? What a nicely done portrait of these horsess…Lovely to see! Brilliant photo. Almost surreal, with the horses looking bigger than the houses. Ah, I remember enjoying the wines of Franken, in, I think a Bocksbeutel?? Yes, Sue, a Bocksbeutel 🙂 !! Thanks for commenting !! Well, I don’t know how I remembered that!